We are continuing our work building new elevators and a new stabilizer for our project. 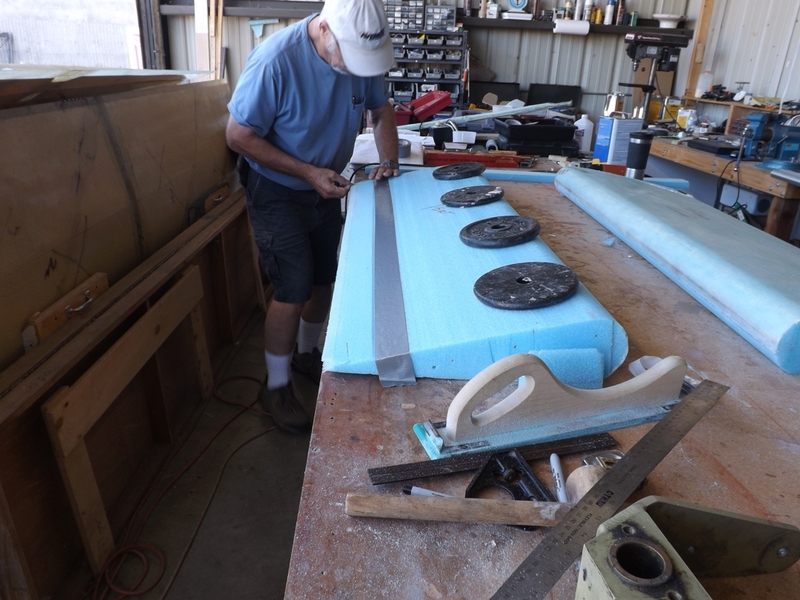 In the last 2 weeks we fiberglassed skins onto the two elevators, cut out the port and starboard horizontal stabilizer, bonded the two halves together to make a one piece stabilizer and finally made mounting hardware for the elevators and stabilizer. 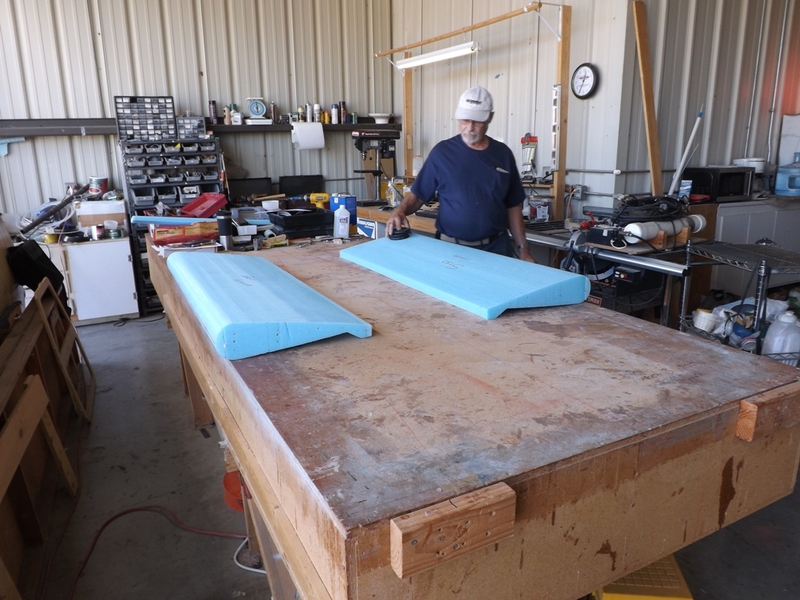 The two new elevator foam cores cut out and ready to cover with fiberglass. 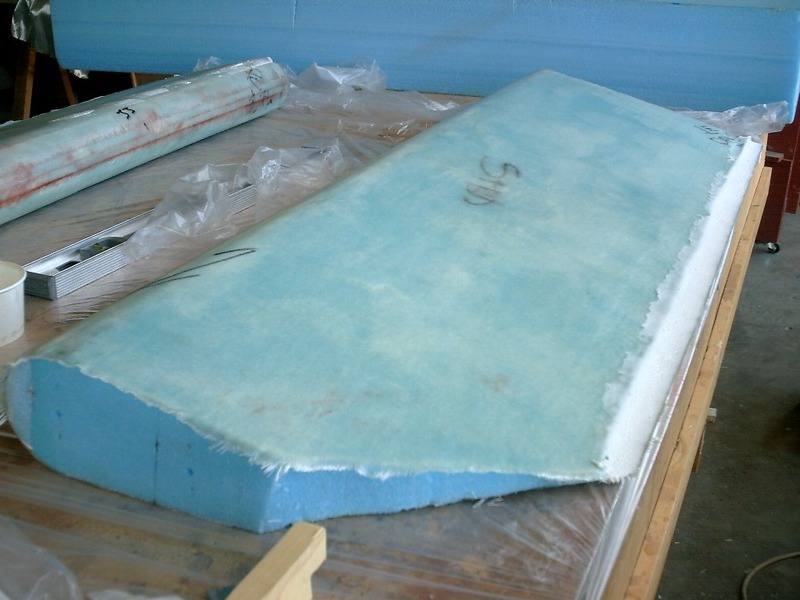 little pockets and irregularities in the foam before laying on the fiberglass. Glassing an elevator bottom skin. This new elevator design has a skin of two layers of unidirectional fiberglass. 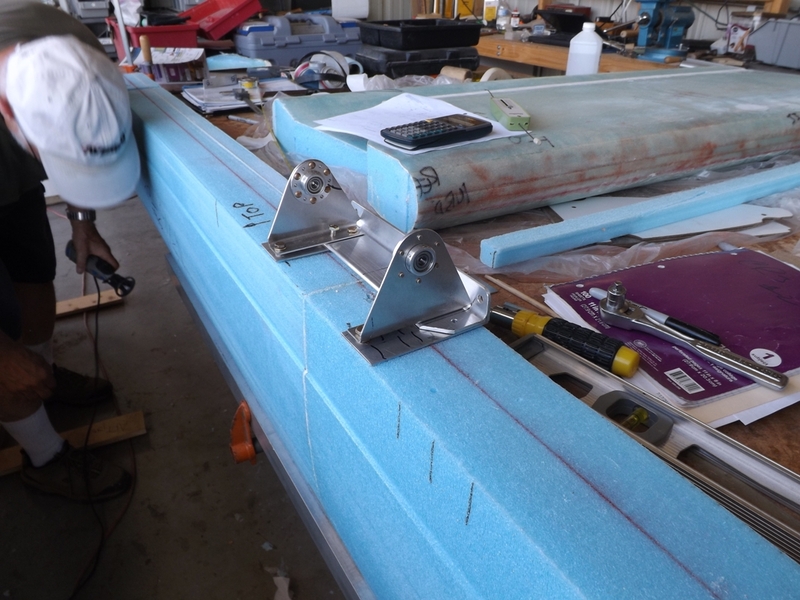 One layer has the fibers running from edge to edge, and the second layer runs diagonally from the forward inboard corner to the aft outboard corner. This will produce a light but stiff elevator. 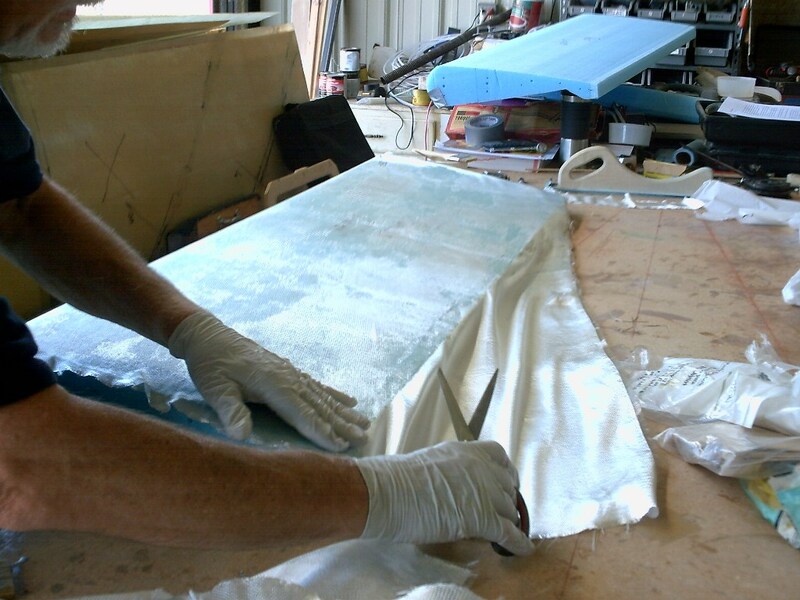 We fiberglassed the bottom skin one day and allowed it to cure. Next we will prep the top surface. Lower skin of elevator has been cured and trimmed. Ready to prep the top surface for its skin. as we glass the top and bottom surfaces. 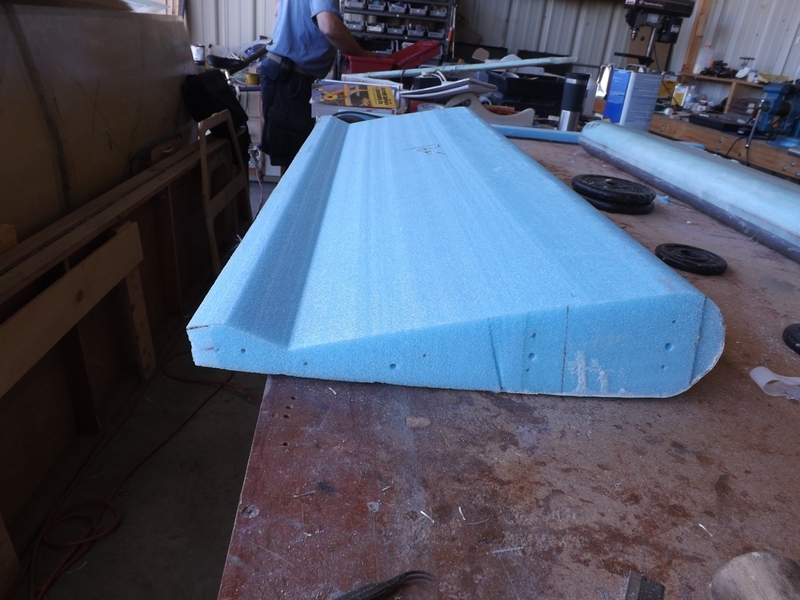 Now that the bottom skin has cured, the edge will be stiff enough so that we can cut off this hunk of foam. 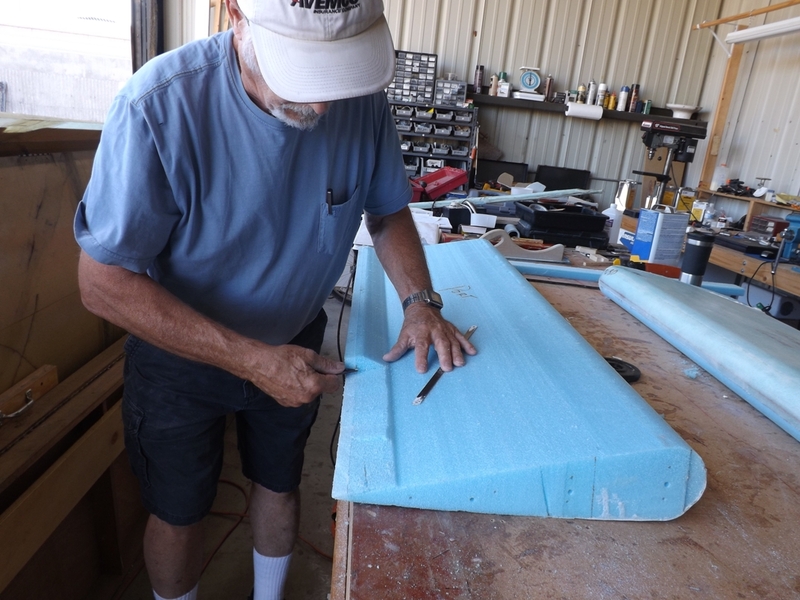 Chuck is using a hacksaw blade to cut the polystyrene foam to its approximate final shape. 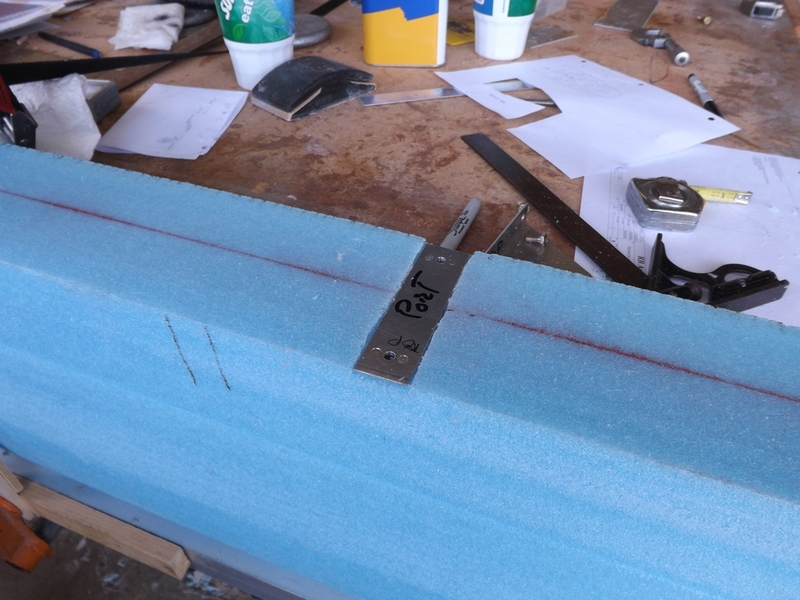 After the fat aft edge has been cut off, we added duct tape over the area next to the cut so that we can sand it down without digging into the nice smooth foam surface. 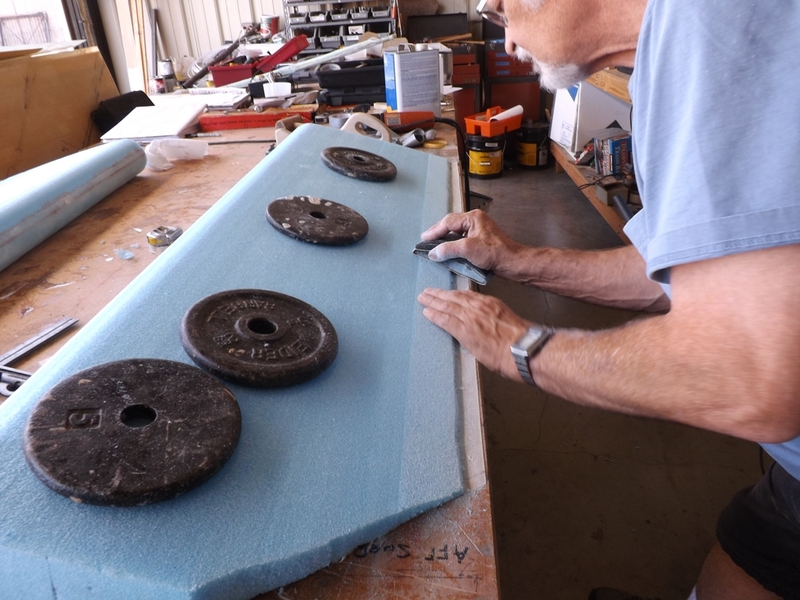 Chuck is using a sanding block to do some finishing touches to the rear surface and making it ready to glass. 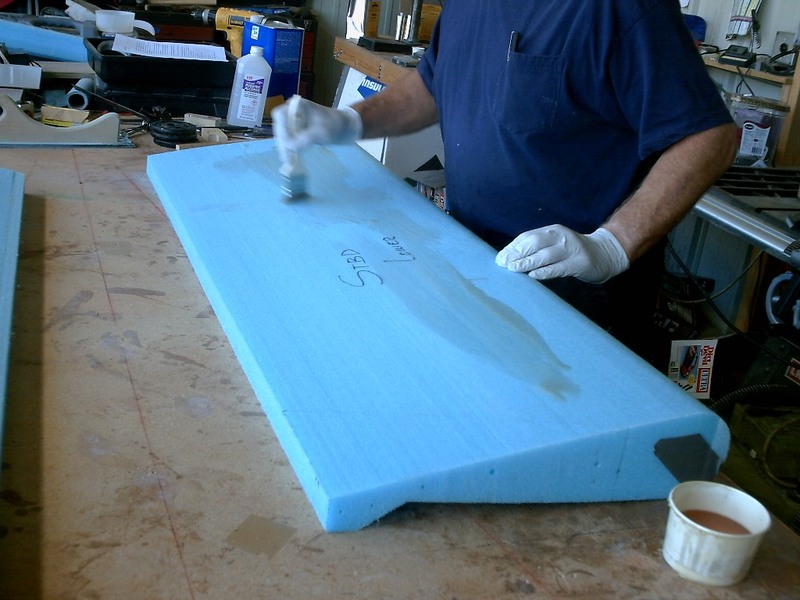 Notice that there is a 1″ wide strip (white area at table edge) under his hands where the foam has been completely removed. When we glass this top skin, the top and bottom skins will be bonded together along this aft edge. 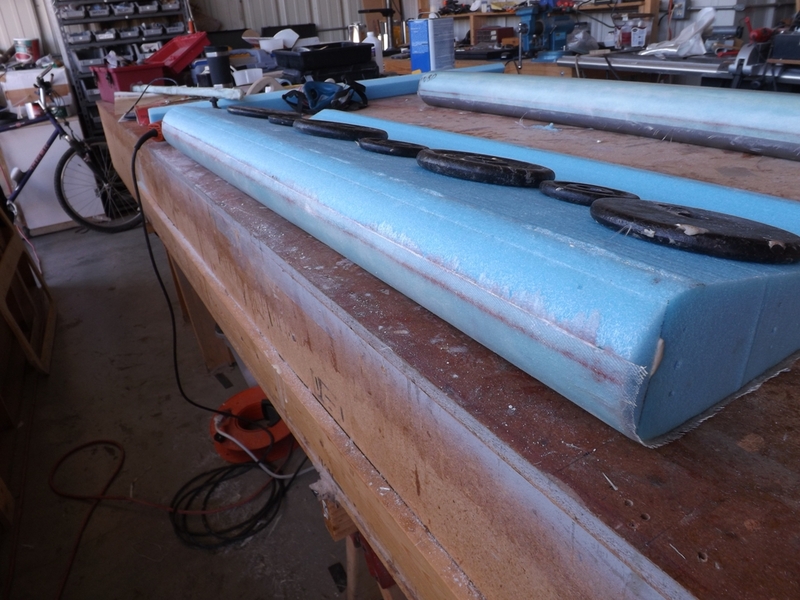 The top skin has been added and after it was fully cured, we added a slurry of glass micro spheres and resin (“micro”) to the trailing edge (white area on the right). 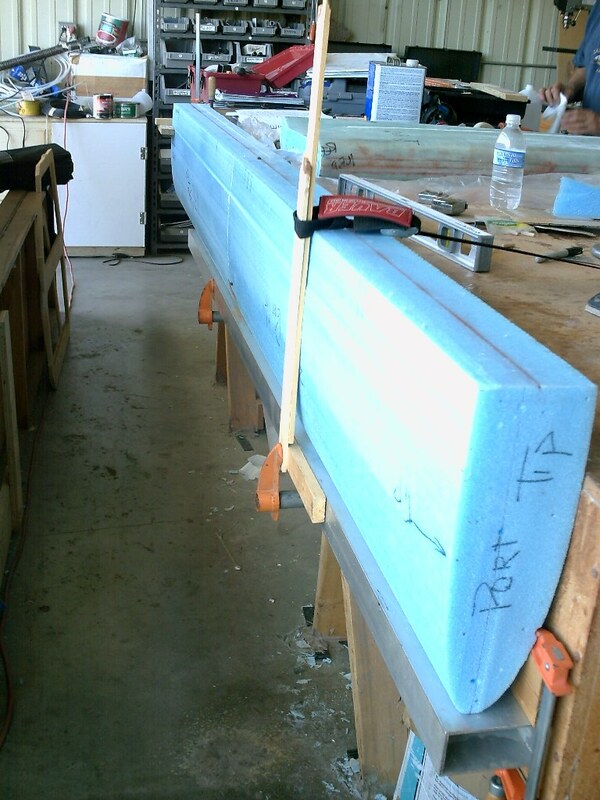 The “micro” will allow us to make the aft edge thin yet stiff. 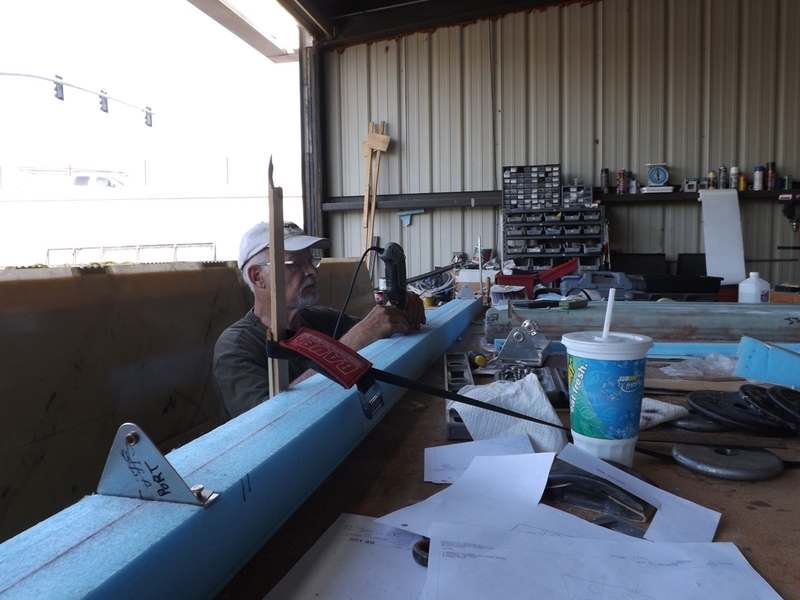 Getting ready to hot-wire cut the horizontal stabilizer’s port and starboard foam cores. 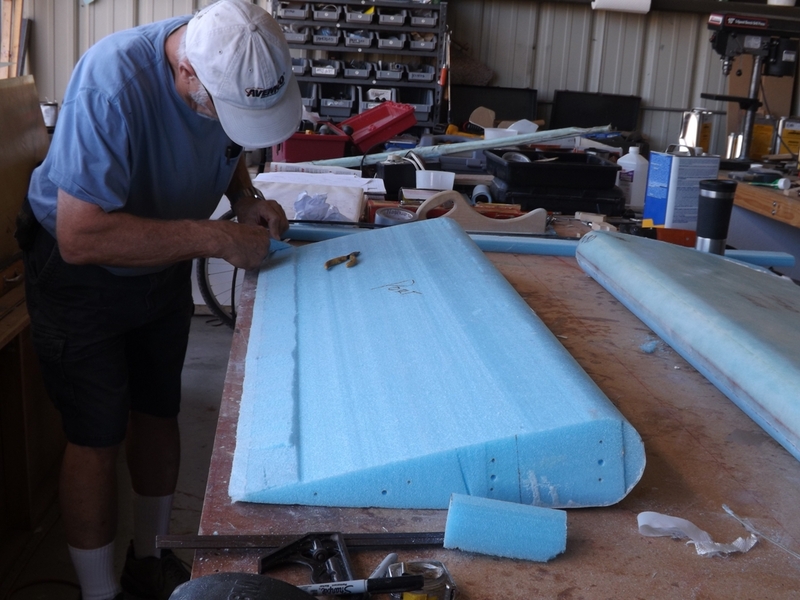 Here is the foam core for the port horizontal stabilizer all cut out. 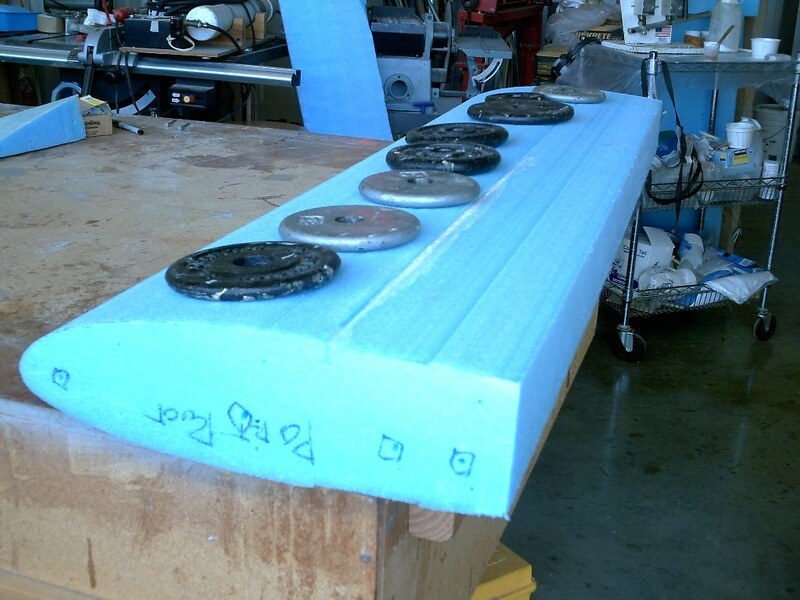 The port and starboard stabilizer halves have been joined together with a slurry of “micro”. 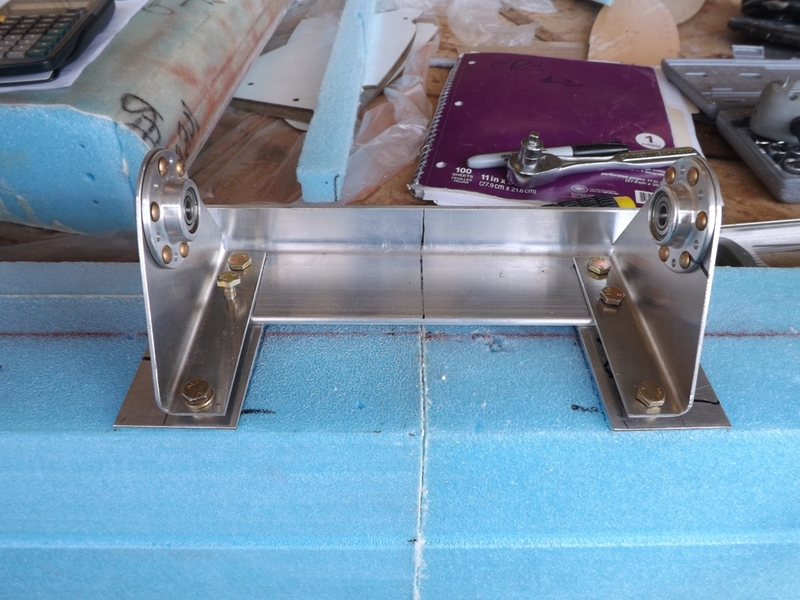 After curing, we will test fit elevator hinge mounting plates and brackets onto the aft edge which is the flat area along the top. 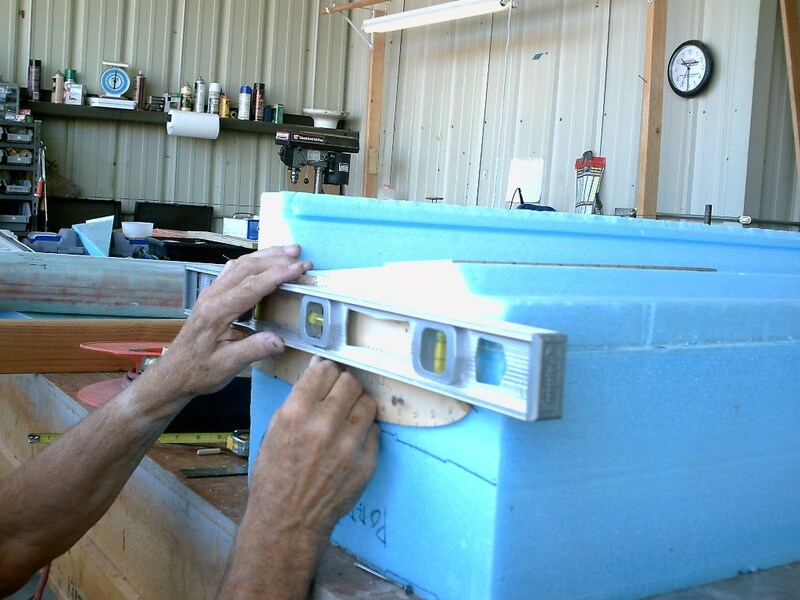 A pocket has been cut into the foam and a mounting plate is being test-fitted. Inboard elevator brackets and mounting plates in position. Chuck using the Dremel tool to cut out indentations or pockets for the mounting plates to go. Darryl, it boggles my mind that you and Chuck actually know what you’re doing. Even the hardware you use to measure or hold things together seem to be something created just for your building project. Fascinating. Good posting and pics. I can hardly wait to finish the stab and elevators. we are having great weather and lots of visiting and eating (seems that is a Behrens’ as it is a Ray thing).